Incumbered by paper-based workorders and instructions relayed verbally, Cable TV company Videotron needed a solution that helped manage service requests in a way that cut costs, sets it apart from the competition, and showed market leadership. 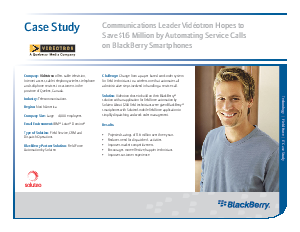 Videotron chose to build on their corporate BlackBerry solution with an application for field force automation by Soluteo. About 1,200 field technicians were given BlackBerry's smartphones with Soluteo's mobile field force application to simplify dispatching and work order management and the results were outstanding.